This colorful artwork features a bold peacock! The bird is sitting pretty, and done in shades of blue with lots of teal and green. 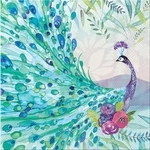 The peacock's tail cascades down, and the bird is surrounded by flowers and a blue and purple background. Punch Studio's Indian Peacock is sure to delight anyone!